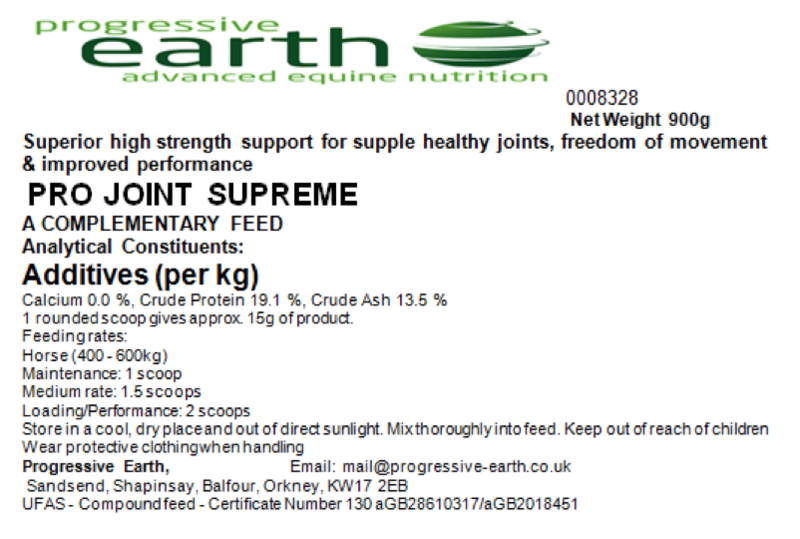 PRO JOINT SUPREME – High strength support for supple healthy joints. Can also be fed to compliment any of our forage balancers. Pro Joint supreme is a superior high strength joint supplement. It is specifically formulated with optimum ratios of Glucosamine, Chondroitin, Hyaluronic Acid, MSM and Grape seed extract. Research has shown that to be most effective these key ingredients work better when combined together. 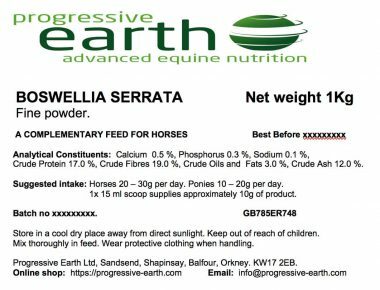 Progressive Earth have combined these ingredients at optimum ratios for maximum support for supple healthy joints, freedom of movement & improved performance. Glucosamine: The building block of all connective tissues, including cartilage. 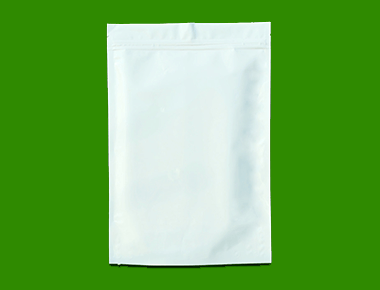 It’s a constituent of glycosaminoglycans, which are found in cartilage and synovial fluid, a thick, viscous fluid that reduces friction between joint cartilage. Chondroitin: A structural component of cartilage that helps it resist compression during weight-bearing movement. Recent research showed superior results when chondroitin was combined with glucosamine. Hyaluronic Acid: The primary component of synovial fluid, a thick, viscous fluid that lubricates joints for smooth, friction-free movement, shock absorption, delivering nutrients to cartilage and carrying away waste. MSM : An important component of connective tissue, playing a particularly important role in bones, joints, tendons, hooves and skin and aiding recovery. Grape seed extract: A potent antioxidant and excellent accompaniment to joint formulations as it helps with oxidative stress resulting from free radicals generated during equine exercise, immune system activity or environmental exposures. High: Suggested for high performance activities when joints are under increased strain and/or increased levels of stiffness. This level is also recommended as a loading rate for the first week or two of supplementation for horses 400 – 600kg. 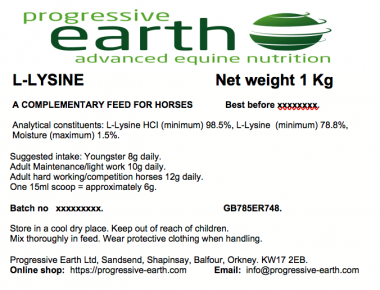 Medium: Suggested for moderate to high intensity workload/performance & stiffness.This level is also recommended as a loading rate for the first week or two of supplementation for ponies under 400kg. One 900 g bag will last 60 days when fed at the rate of 1 scoop per day for maintenance, and 30 days at a rate of 2 scoops per day for a high level of joint support. 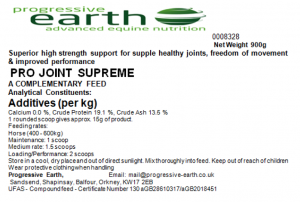 Pack size and availability: Progressive Earth Pro Joint Supreme equine feed supplement is available in resealable grip seal pouches containing 900 g of product. A 15 ml scoop is included.